The Evanston Symphony is a key player in an innovative program designed to teach pre-school age children the basics of music. Since 2006, the ESO has partnered with Evanston-Skokie School District 65, providing orchestra musicians who volunteer to work with as many as 400 students ranging in age from 3 to 5 years. 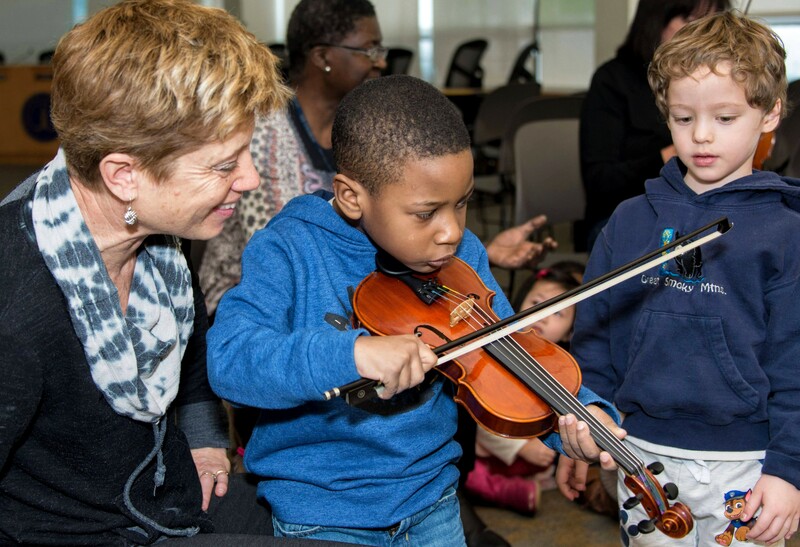 In classes averaging 25 students at the district’s headquarters on McDaniel and Grove in Evanston, the musicians demonstrate how to play their full-size instruments and help the kids learn how to hold, bow and play smaller violins. In addition the musicians accompany Chicago keyboard artist Charles Taylor in leading the kids in song. It’s all part of the district’s “Music in Your World” (MIYW) program, designed to ignite interest, understanding and love of music. But there’s more to it than music. By teaching the basics of rhythm, melody and playing, the district believes it can enhance early childhood literacy. Most of the children are part of the district’s Head Start and special education programs for kids at risk, generally with limited access or exposure to music and the arts. In collaboration with the Evanston Public Library, District 65 is pursuing a program called “Every Child Ready to Read,” which promotes five key areas for pre-literacy: talking, singing, reading, writing and playing. This year the program is expanding from bi-monthly to monthly class visits. The ESO musicians and Mr. Taylor will join forces two days a month every other month. In addition Mr. Taylor will visit with the children on alternate months. “The increased exposure will help the kids retain the basics and learn more about how to appreciate and play,” says Ms. Small. This program is funded by First Bank and Trust, the North End Mothers’ Club, and the Kiwanis Club of Evanston.